Neumann (right) at a press conference to announce PSA's takeover of Opel. 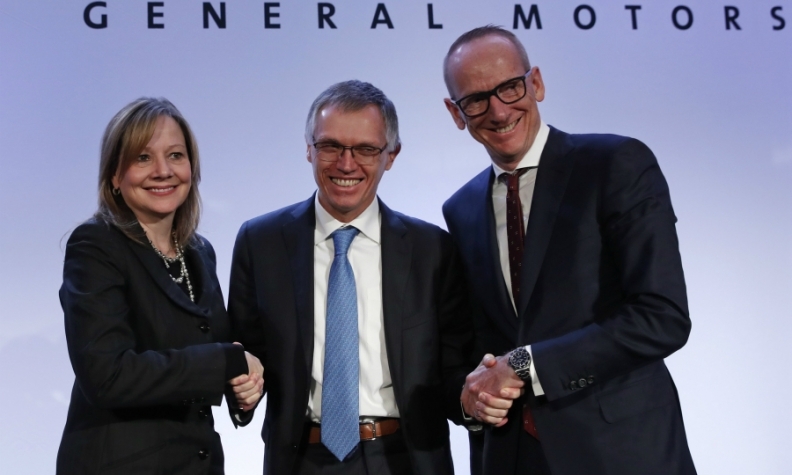 He is joined by GM CEO Mary Barra (left) and PSA chief Carlos Tavares (center). FRANKFURT -- The next Opel/Vauxhall Corsa will be delayed as new owner PSA Group moves to shift the brand's next-generation cars onto the French automaker's platforms. Opel's lineup will be redeveloped with PSA technology and vehicle architectures with the first new PSA-based Opel models due around 2020. The technical convergence means the next version of the Corsa subcompact will be delayed by a year to 2020 as the car goes back to the drawing board, according to presentation slides shown to analysts by PSA on Monday. "Our planning teams are already working on that," PSA CEO Carlos Tavares said. Another five PSA-based Opel vehicles will follow by 2023. Existing Opel models will be barred from entering new overseas markets under non-compete agreements. GM will be similarly excluded from marketing the same underlying technologies in Europe. Karl-Thomas Neumann will remain at the helm of Opel as the German-based automaker is folded into PSA. Neumann has done "excellent work" at Opel and the French automaker wants him to stay in charge, Tavares said on Monday at a press conference announcing an agreement for PSA to buy Opel and Vauxhall. "It is our intention to make sure Mr. Neumann continues the excellent work he has been doing. We trust that he will be in the best position to lead the turnaround and a profitable future for Opel," Tavares said. Neumann said at the same press conference: "I want to stay with Opel and make sure Opel has a great future." Tavares said Opel would have already managed a turnaround had it not been for problems arising from the UK's decision to leave the European Union, a view shared by GM CEO Mary Barra. Tavares intends to maintain Opel's current management structure, but stressed on Monday that the automaker must continue its own push for change. "Opel's turnaround must be achieved and implemented by Opel staff and Opel management," he said. PSA has vowed to return Opel to profit with an operating margin of 2 percent within three years and 6 percent by 2026, underpinned by 1.7 billion euros in joint cost savings. Neumann said PSA's ownership offered "new opportunities" for Opel and Vauxhall. The first products of Opel's earlier industrial partnership with PSA, the Crossland X subcompact crossover and the Grandland X compact crossover launch this year as part of Opel's biggest product offensive to date. "They show that two strong engineering teams absolutely can work together and that it's possible to build a true Opel and and a true Vauxhall on a PSA platform," Neumann said. "Opel will remain a true German brand and Vauxhall a true UK brand," he said. Tavares said the Opel, Peugeot and Citroen brands will keep their current marketing positioning. "We are happy to have French brands and happy to have a German brand," he said. "The market position of Opel is clear and we will reinforce the excellent work that has already been done on Opel's marketing."